Participants approach an issue by breaking it down into generic sections like context, problem statement, solution etc. The pattern names that result form a vocabulary they can share and that is easy to impart to a wider population. Liberal programs are special-interest subsidies for people with advanced educations (like lawyers, physicians, and teachers), and that is why they vote for them. Progressives tend to be smug or condescending because we tend to be highly educated and convinced that we support policies that are better for other people–and this is an unattractive attitude that loses votes. Colleges and graduate schools are moving people left (either because they have ideological agendas or because “reality has a liberal bias”). I’d actually propose a different view from any of the above. Pew does not find that highly educated people are the furthest left. Rather, people with the most schooling consistently give answers that are labeled liberal on a set of 10 items that range over economic, foreign, and social policies. None of the survey questions offers a radical opinion as an option. So Pew is measuring consistency, not radicalism. Ideological consistency is correlated with education, but not necessarily for a good reason. More book-learning makes you more aware of the partisan implications of adopting a stance on any particular issue. So, for instance, conservatives are more likely to disbelieve in global warming if they have more education–because their education helps them (as it helps everyone) to see the ideological valence of this issue. Many of the most educated Americans endorse a certain basket of political ideas that are associated with the mainstream Democratic Party. They have learned to recognize these policies as the best ones, and the policies are designed to appeal to them. All of the positions are labeled “liberal,” so the most educated are deemed liberals. Yet the most educated are not the most committed to equality. Instead, they are quite comfortable with their advantages, even as they endorse positions that Pew calls liberal. To test that hypothesis, I wanted to look at a survey question about equality that has been asked over a long time period with large samples. The best I found was this American National Election Study question: Do you agree that society should make sure everyone has equal opportunity? This is not an ideal measure, because support for equal opportunity is not the most egalitarian possible position. If you are very committed to equality, you may prefer equal outcomes. Still, the question provides useful comparative data. 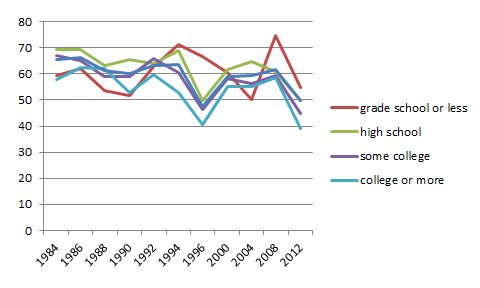 In 2012, the more education you had, the less likely you were to favor equality of opportunity. The whole population was less supportive than they’d been in 2008 and less supportive than at any time in the 1980s. But the least educated were the least supportive of equality during the Reagan years, and now they are the most concerned about it. As of 2012, the most educated Americans are the least egalitarian, even though they are consistently “liberal.” Less than half of them strongly favored equality of opportunity. It’s true that Democrats and liberals are (as of 2012) more likely to support equal opportunity than Republicans and conservatives are–and that the highly educated are the most liberal. 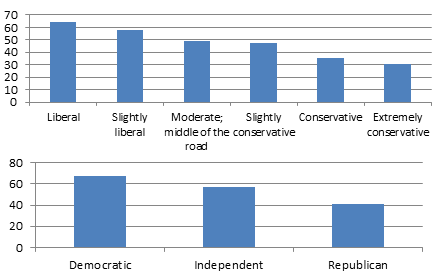 However, the correlations between egalitarianism and partisanship or ideology are not tight. Forty percent of Republicans strongly agree that society should make sure everyone has equal opportunity, as do 30 percent of extreme conservatives. This is partly because conservatives also have an equal opportunity agenda, and partly because the liberal-to-conservative scale is defined by a whole basket of issues. It’s quite possible to be a strong liberal and yet not believe strongly in equality. And I think that is a common view among the most educated Americans–who are also the most advantaged. Registration is now open for May’s Tech Tuesday event with Urban Interactive Studio. Join us for this FREE event Tuesday, May 17th from 1:00-2:00pm Eastern/10:00-11:00am Pacific. Urban Interactive Studio helps agencies and consultants engage communities online through project websites and participation apps that can be tailored to any approach, process or project objective. As web and mobile technology has become commonplace, citizens now expect online participation options, but public engagement practitioners are often forced to cobble together inflexible off-the-shelf tools that only partially meet their engagement needs. UIS’s EngagingPlans and EngagingApps deliver a comprehensive, feature-rich, and adaptable solution that helps meet varied objectives at every project stage, from early visioning to final draft review and interactive online plans. EngagingPlans and EngagingApps inform and involve broad audiences while also generating actionable insights for decision makers. EngagingPlans bundles the most widely used features into one project hub that reaches, informs, and involves citizens and stakeholders in civic projects and decision making. EngagingPlans websites form the backbone of digital project communications, keeping documents, events, news, and FAQs accessible and collecting community feedback through surveys, discussions, idea walls, and draft reviews. As projects progress beyond open-ended visioning, the choices for online engagement software decrease drastically. EngagingApps are semi-customizable mapping tools, workbooks, interactive plans, and simulators that encourage informed, specific feedback about topics like commuting habits, proposed land use designations, design concepts, growth scenarios, and funding allocation. On this call, NCDD Member Chris Haller, Founder & CEO and Emily Crespin, Partnership Manager of Urban Interactive Studio will walk through examples of both EngagingPlans and EngagingApps in action, with particular emphasis on how EngagingApps can be configured to address unique participation objectives during each stage of any public process. Participants are encouraged to review the UIS website prior to Tech Tuesday and be prepared for a high-level overview of EngagingPlans and an in-depth discussion about EngagingApps and strategies for implementation. Don’t miss out on this opportunity to see these tools in action – register today! Looking for assistance with organizing and sustaining productive public engagement? Struggling to decide how to combine online and face-to-face engagement? Frustrated with the standard "2 minutes at the microphone" public meeting? Want to know about the latest tools and techniques? Need expert advice on bringing together a diverse critical mass of people? In concert with the Tisch College for Civic Life at Tufts University, Public Agenda is offering a one-day workshop designed to help you tackle these key democratic challenges. Join the Public Engagement Strategy Lab! demonstrate a mix of small group and large group discussions, interactive exercises, case studies and practical exercises. This Strategy Lab is hosted by Tisch College, Tufts University as a preconference session for Frontiers of Democracy 2016. Participants in the Public Engagement Strategy Lab have the option of staying for the Frontiers of Democracy Conference. To register for the conference, click here. The Public Engagement Strategy Lab will provide you with the tools and resources you need to authentically engage stakeholders in thoughtful, democratic processes. No more public forums and community meetings that lack impact. Move your public engagement planning forward with approaches based on the ideas and examples found in Public Participation for 21st Century Democracy (Wiley-Blackwell, 2015). To register, follow this link. We hope to see you there! This new article explores reasons that k-12 athletics may boost civic engagement, as well as some important differences between sports and civic life. Student associations in general teach civic skills, and sports are best understood as examples of associations. Indeed, high school teams should be more like standard school clubs, in which participation is voluntary and the students are primarily responsible for managing the group. The article, It’s Your Money. Where’s Your Say? written by Larry Schooler was published February 2016 on Huffpost Politics blog. Schooler discusses the juxtaposition of some governments relationship with the public- some increasing transparency and public engagement experiences, while others are quick to restrict public’s access to information and public control of the state’s budget. The article tips hat to the use of Balancing Act [from Engaged Public] in San Antonio (TX), and the steady increase in participatory budgeting processes around the US. Below is the article in full and you can find the original on Huffpost blog here. In our private lives, we have quite a bit of say over how we spend our money. Granted, an employer or client ultimately decides whether and what amount to pay us, but if we want to spend more on a house than on vacations, or more on our children’s education than on dining out, that’s our decision. Seems strange, then, that when it comes to our tax money, our say often doesn’t amount to much. Often cities, counties, states, and the federal government take minimal input from the public on their budgets—ironic, given that a budget is widely viewed as the single most important policy a government approves. It’s almost like taking the decision about what house to buy away from the homebuyer. I have been thinking about this for a few, somewhat contradictory reasons. I read this piece from Arizona, where the Governor decided to increase both transparency and input opportunities on his state’s budget, but the state House decided “not to allow public comment during departmental budget hearings to be held over the coming weeks.” Scheduled public hearings won’t help much because they’ll happen without any legislative budget to discuss. On the other hand, more and more cities and state agencies are taking steps to increase public involvement in the city’s budget. San Antonio, Texas, used the user-friendly tool “Balancing Act” (in both English and Spanish) to help the public get their hands dirty figuring out how to manage city finances. Other cities, including Hartford, Connecticut, have taken similar steps with online budgeting tools. And in Austin, the “Budget in a Box“ gives groups and individuals a chance to talk with one another about how to manage city finances. In San Antonio, officials found more than 1,200 unique users spent an average of more than ten minutes on their tool, suggesting they did more than offer knee-jerk reactions to the questions of what to fund and how much. But if this were just a game to make the public feel better, I would not have taken note. On the contrary: the city’s adopted budget for Fiscal Year 2016 (their largest ever) included a $23 million increase in street maintenance and a $10 million increase in sidewalk/pedestrian safety, all while reducing property taxes, all of which were the priorities citizens had in their responses. Perhaps even more interesting is the explosion in the use of “participatory budgeting,” which got its start in Brazil but has spread to cities small and large across the U.S. This strategy gives the public the ultimate say over the way a portion of the budget gets spent, through a secret ballot vote that the sponsoring city or other agency commits to respect and implement. So, why such a contrast? Why would some government officials want to keep the public out of budgeting and others bring the public closer in? As to the latter, an interesting study in, of all places, Russia found that participatory budgeting actually “increased local tax revenues collection, channeled larger fractions of public budgets to services stated as top priorities by citizens, and increased satisfaction levels with public services. “ It stands to reason that if you ask the public what they want to buy, and how much they want spent on those services, they’ll be happier. As to why public input into budgeting might not be such a good idea, perhaps elected officials fear that greater exposure of their budgetary decisions would shine a brighter light on questionable moves that favor top donors or influential special interest groups, rather than the public as a whole. Perhaps they think that increased engagement would take too much extra time or, ironically, cost a lot more money than the status quo. But that perspective overlooks the unintended consequences that can accompany budget choices made without the public: the ongoing Texas public school finance fight comes to mind. Neither time nor money was saved; if anything, it’s taken a lot longer and cost a lot more than lawmakers ever intended. To be sure, changes in the way governments involve the public in budgeting would require a paradigm shift for just about everyone: elected officials, public administrators, and even the public themselves. But it could end up making it easier for lawmakers to stomach otherwise difficult choices around tax rates and funding levels. After all, if a lawmaker can show how a budget truly reflects what the constituents want, that’s worth a lot in political, and campaign, capital. Larry Schooler manages community engagement, public participation, and alternative dispute resolution projects for the City of Austin, Texas, where he conducts small and large group facilitation, strategic planning, collaborative problem solving, consensus building, and mediation sessions. Larry also works as a mediator, facilitator, and public engagement consultant for outside clients. He is a senior fellow at the Annette Strauss Institute for Civic Life at the University of Texas; on the faculty of Southern Methodist University; and Past President for the International Association for Public Participation (IAP2-USA). His work has been featured by a variety of organizations and publications, including Governing Magazine and the National League of Cities.